In the on30 forum, you asked the question of how to create freestanding rocks as you had to do some for your RR. In "The San Juan Central," Malcolm Furlow described how he did such a thing with expanding foam and a rock mold by filling up the mold and rolling it back onto itself. If you don't have this book, let me know. I can scan a few pages for you. I have the original article with that technique in it, but thanks for the offer. What I really need are basically big rocks laying around, and I could use real rocks but the color won't match my plaster rocks. When I get back to scenery I will try harder to find what I am looking for. Right now I am concentrating on getting my layout operating. I am building a bunch of flat cars and another caboose. Scratchbuilding everything just takes forever. Bragdon has a wide range of latex molds for rock casting. Some are very large, you should be able to find one that suits. The hillside is a plaster casting, the talus is West Va. shale, which had a reddish cast. Following basic Dave Frary techniques of spraying diluted latex paint and stains on the casting and rocks brought them all around to the same color. Whatever you use for talus will probably be darkened by the process of gluing it down, but layers of diluted paint and ink will pull it all together. Well guys I have to say that am not big on operation or electronic but I am finding this interesting how you guys are do it. I have gotten interested in battery operation instead of DCC etc and I also like the idea of hand operating the turnout however I like the Tortoise switch machines and "Hare" DCC thing to throw them that you are using. You have given me a lot to think about. Jeff your layout is awesome every time I see updates I'm blown way by what you are doing. I have been a fan of your modeling since the HO layout which I think was one of the best small coal orientated layout ever. Your On3 one is even better. Mark I like the look of your rock work. Is that in the James River "canyon" area in the back corner. Also I really like what you said about the new Narrow Gauge book by Tony on your web site. 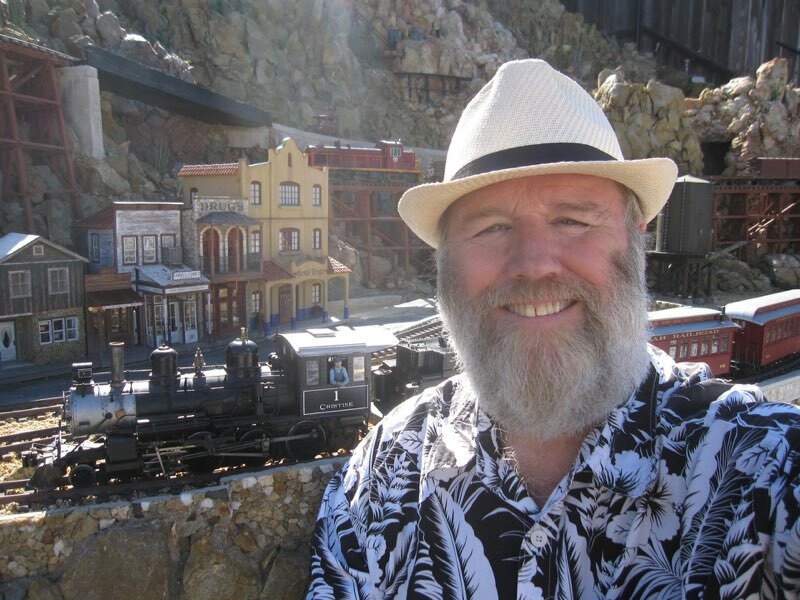 As a very long time narrow gauge modeler I only found your part and Jeff's part of the book of any interest. It was great seeing you guys stuff in print. As for me it is my intention to start my own layout adventure this year. I'm planning an operating diorama in a shadowbox setting. Like Mark I like quarries and living in the Sand Hills area of North Carolina I'm going to do something along those lines. However Arkansas Line and Palmetto Brick are two of my favorite industrial lines so they will influence what I do. So step one is doing things the way you did Jeff. 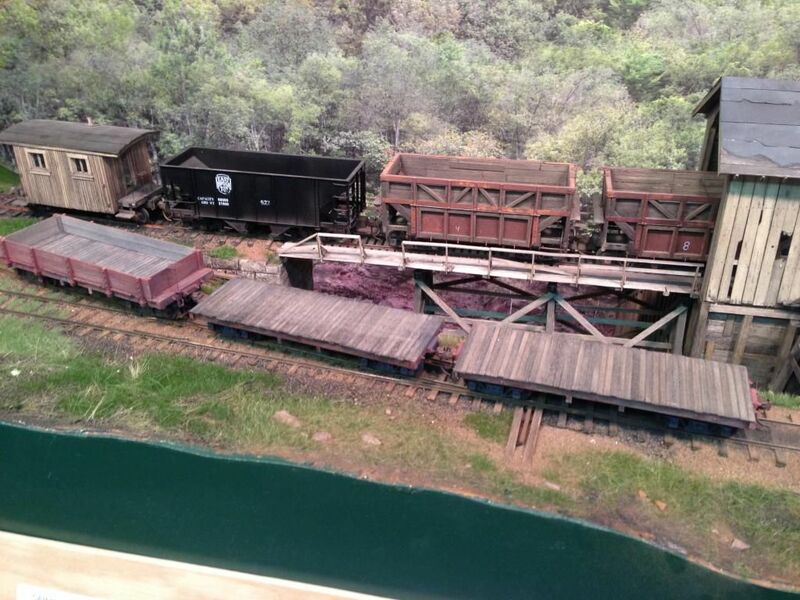 I remember reading about you building the dump cars before anything on the layout. so right now I'm creating rolling stock. I'm gang building 10 PSC Western Wheel Works side dump kits. It would be fun to have them operate like your cars do but all the chains would be impossible to deal with so if I decide to go that way maybe I could load them instead of dumping them. Anyway you guys' stuff is very inspiring to me. Look forward to seeing more. I agree with Mark on Tony's book. It is a sort of a shame that there is not a good book that has some hard usable data for narrow gauge modeling. I had to learn the hard way about minimum radius and how bad locomotives go down hill. 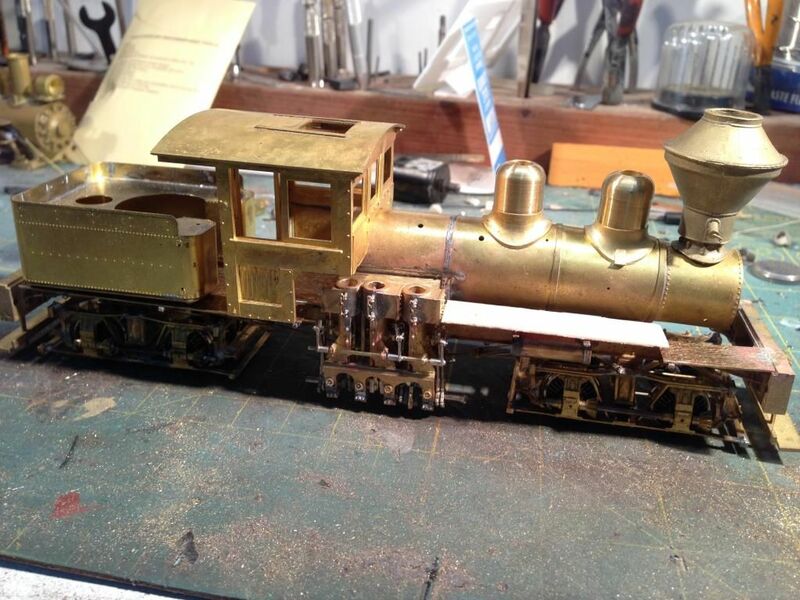 I also have been struggling getting old brass On3 locomotives to run well, so far in the end I have been winning and I have some really nice running stuff. I also struggled with couplers, and coupler heights and freight car designs, like how to make them go around sharp corners. 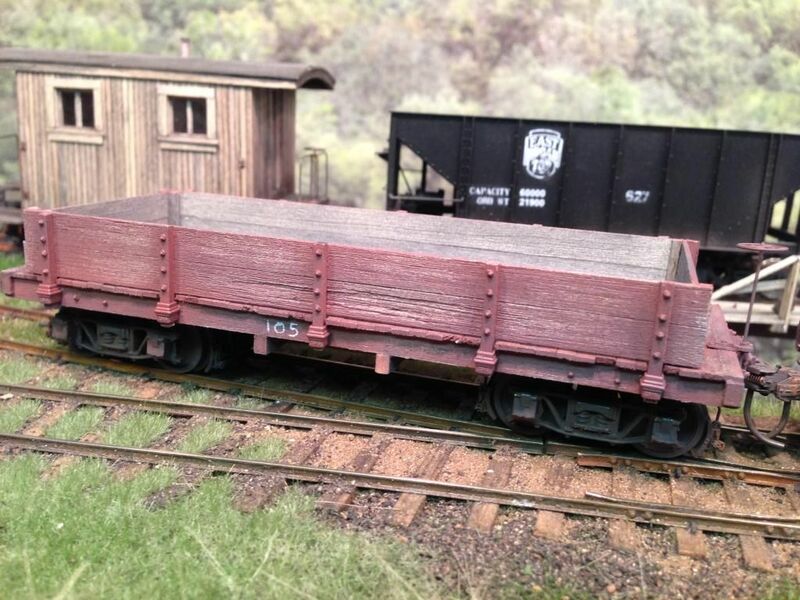 as far as operating dump cars I think Arizona Dave has a great simply way to dump those side dump cars, he uses Bachmann cars but I am sure it would work well with the PSC cars. Dave uses a rod that comes up through the scenery to push up on the bottom of one side of the car, search his post on the Thunder Mesa and you can see it, he even has a video on Youtube of it. since I am on my post I might as well give an update. I have been deep in Nova work and have only been picking at stuff on the layout. I rented shop space and have both the 49 pickup and the Nova together. 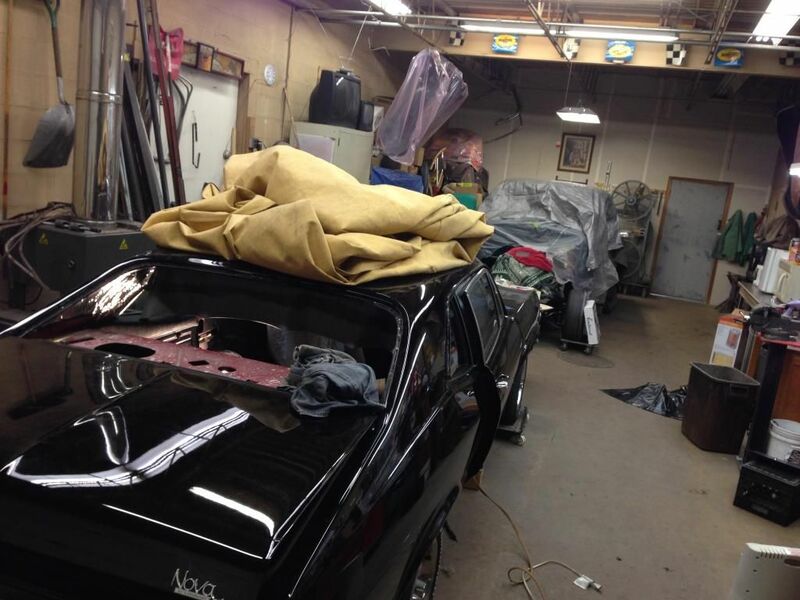 If all things go well both should drive out of the shop in the spring, for the Nova it will be the first time running since the fall of 1986! 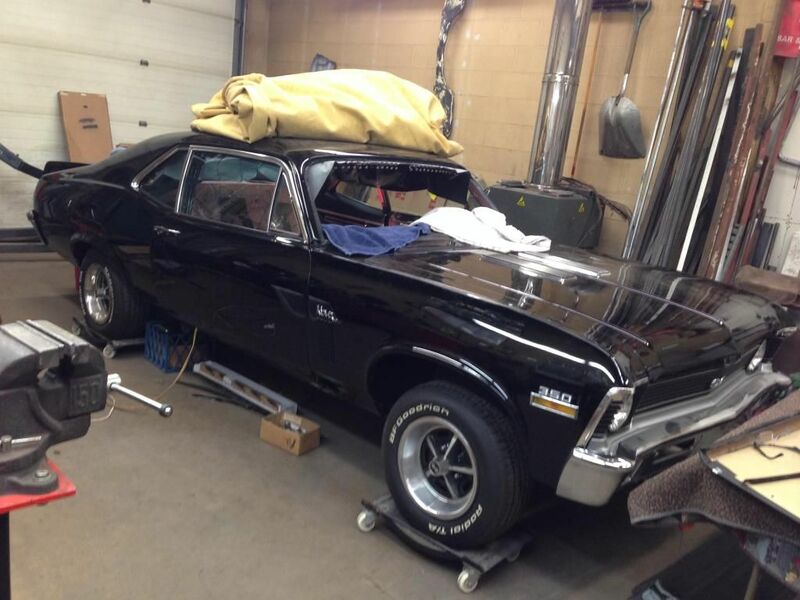 right now the Nova still has the motor out and I am installing the interior, what a pain. The 49 has the motor in, cab mounted, box mounted and is in the wiring stage. as for trains, since I started operating the layout it became clear I needed some flat cars. I started building three 18' flat cars, one of which I decided to convert to a gondola. The gon is finished and I am waiting for some parts to be delivered to finish the other two flat cars. I also needed something to haul because one of the waybills I have calls for a load of rail. To generate more variety of traffic I am claiming that the SCRy is in the process of laying a new mine spur farther up the line, which creates traffic in the form of rails and ties that runs from interchange all the way across the RR to the upper end staging. To add even more interest I am stealing another idea from the Manns Creek, I am going to have a creosote treating tank behind the company store, raw ties will come from the C&O and go to the company store, dropped off and then treated ties reloaded to be taken up the line. here is a rail load I made. 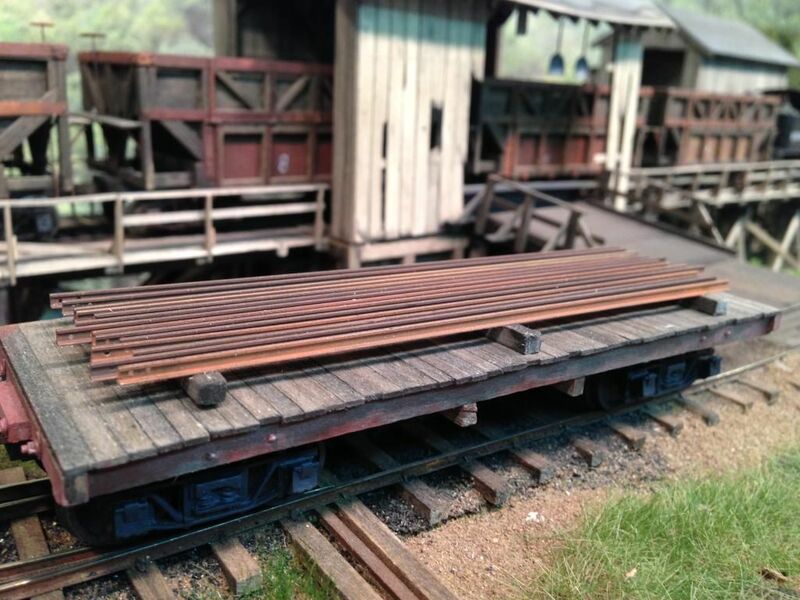 I am sure the rails would have just bend piled on the flat car in real life but I glued them to ties to keep the load one piece for easy removal. I am also working on two locomotives, still working on a drive for the Heisler, I made a chain drive which was great except going down hill it bucked way too much, now I am doing a worm drive. 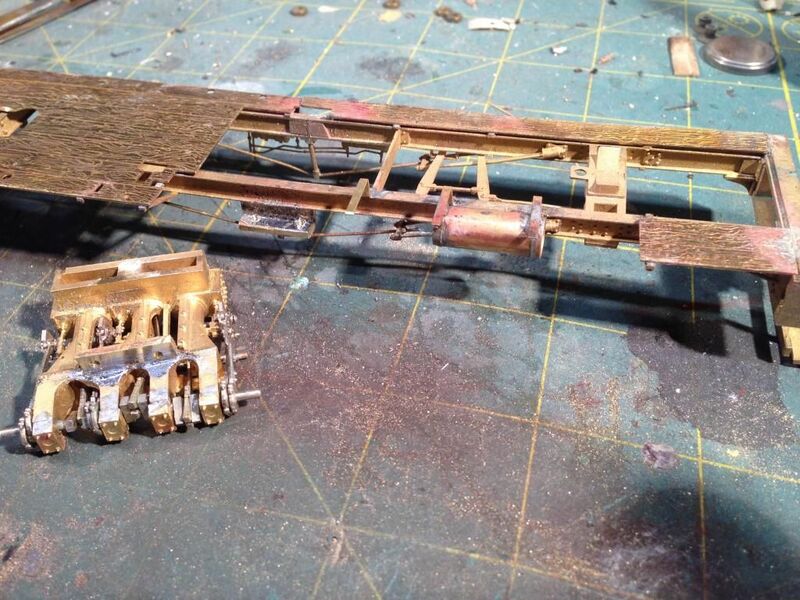 I also have returned to working on the PSC Santa Barbara shay kit, I converted the cylinders so they mount to the frame and not the boiler, that way I can remove the boiler and keep the cylinders intact on the frame. I also modified the walkway to resemble MC #2 with a small air tank hung under a raised section. The wood walk way in the picture is just a stand in to see how it will look. I am going to use real wood for all the floors and walk ways but they will be individual board laminated over brass for strength. here is a view that shows the bracket I soldered to the frame and cylinders. Good to see some updates, Jeff. Drilling holes on the end of the rails- that's a nice touch. I am looking at the photos of the Nova, and it looks like you mocked up a little ball fringe action along the top edge of the windshield ... ai caramba! The visiting EBT hopper looks small compared to your homeroad cars. I decided not to use the Bachmann twins because they look way too big on my pike. I believe there is a cover photo of a flatcar load of rail headed up Cass Scenic RR on an old Mountain State newsletter. If you don't have it, I can email you a copy. The holes in the ends of the rails was one of the details I thought would be neat, but halfway through (and three drill bits later) I thought would it really be worth it, and I guess it was because you noticed it. I did not add anything to secure the rails because I have some photos of logging work trains that show flat cars with rails just laying on the flat cars, I guess the short distance and slow speeds don't require it, same reason grease buckets will just sit on the Shay walkways. Jeff, an easier detail could be had by using some Grandt line rail joiners with the bolt heads on them . You could remove some bolt heads and drill holes in nthem a lot easier than the rail. The holes in the rail really jump out at the viewer and worth the effort and broken drill bits. Mark, I would love to see the photo. finally got out the photo etching kit I got from Micro Mark and tried to make the cab parts for my shay. The kit recommends that you use a maximum thickness of 0.010" brass but I like to make my models from 0.015", which I feel give the models more strength yet is still thin enough to emboss good rivets. 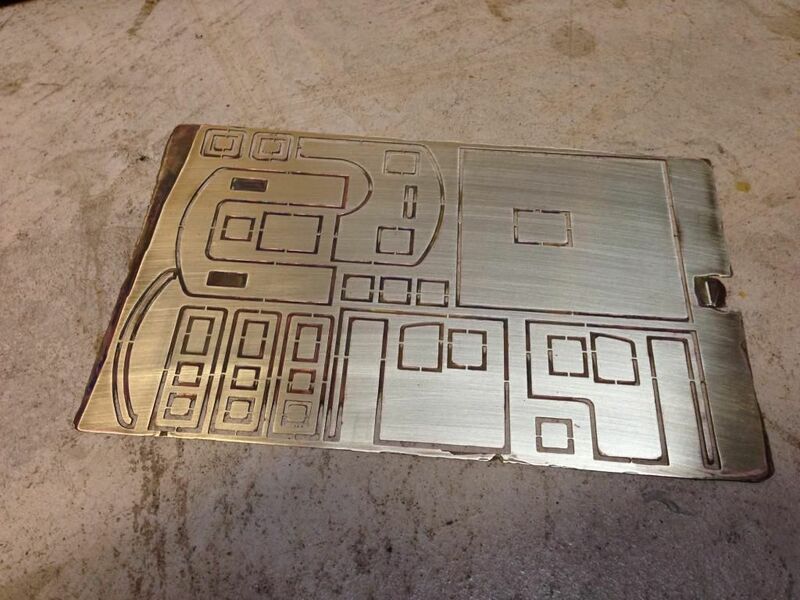 It is possible to etch in rivets, and in small scales I think that would be fine, however in O scale I think embossed rivets look better, so for my first try I was just going to do a same etch on both sides of the brass. I did read through the instructions before I started but somehow I missed the part about keeping the etch size to a maximum of 3" x 3". Since I did 4" x 5" I could not use the etching tank that the kit came with. Nothing like ignoring two recommendations right out of the gate when trying something new. I made my artwork using AutoCAD, which was easy for me and went pretty fast. I printed it out on card stock and test fit the cab first. Then I printed out the image on the supplied film. the kit came with a laminator which is used to adhere the photo resist to the brass. The photo resist is a film that is laminated to the brass and protects it from the etch solution. Luckily the laminator was large enough to handle my larger piece of brass. After I got the photo resist laminated to the brass it was time to expose the photo resist. the way it works is that the black images on your art work protects the photo resist from being set onto the brass. All areas of the photo resist that are not blocked from light become bonded to the brass and creates a protectant on the brass that won't allow the etching solution from eating away the brass. So all the areas on your art work that are black will be eaten away. They say you can use the bright noon day sun but it is midwinter and the sun's rays do not have much power so I used a light bulb, they say a 100W bulb will work but I had a 250W photo flood that I used. Exposing only takes a few minutes on each side and it was easy to tell when it was done because the film turns a deep blue. up to this point everything was going well and it was time to get out the chemicals. The first step was a quick dip in the developer, only a minute or two is all it takes, then it goes into the etch tank. Micro Mark provides a neat little tank with an air agitator that you clip your 3" x 3" brass piece to and sit back and wait. My problem is that my piece would not work in the tank because they don't provide enough etchant to fill the tank, and my piece would have had to have a full tank. So I took a plastic tray and used it, the trouble is I had to be the agitator. I had to constantly rock the tray for 30 minutes. In the future I will make sure to only do 3x3 pieces and use multiple pieces instead of one large piece when I do my Heisler cab. Two problems I had when doing this, first is they instructions said to warm the etchant in the microwave for 1 minute. With 5 seconds to go my bottle blew a hole in it at the top and squired etchant into the microwave . next time I will loosen the cap to vent pressure. The second issue I has was some corners of the photo resist lifted about 20 minutes into to etching, my guess is the thicker brass needed more heat to bond the photo resist, next time I will either run it through the laminator a few more times or hit it with an iron after the laminator to stick it down better. Because the corners started to lift a bit I had to stop the etching process just before some areas were etched all the way through. It is not a big deal as the void areas were very thin and I have been able to use an xacto knife to cut out the parts. In the end I had a lot of time in this process, maybe next time it will go faster. My guess is I could have cut out all the parts myself faster, however the parts I got are perfectly accurate. this week I will emboss the rivets and solder it together, pictures will follow.